This week’s automotive agonising concerns a flipping nuisance, turbo trouble, dinks and scratches and in part two a heated exchange, an over-revving engine, economies of scale and infinitely more to occupy you on a predictably freezing cold day. On holiday in Cornwall last month I stayed at a property with a parking space. A parking pass was provided, which I duly applied to the windscreen in a tax disc holder supplied by the owner. Unfortunately it fell off in the heat and flipped over in the process showing the red backing uppermost. An ARMTRAC inspector came by and left a PCN on my screen. He took photos which shows the red disc upturned sitting on my dash. I have appealed the notice (had I paid the initial fine it would have been £60 but now having appealed it goes up to £100, should I not have a decision in my favour) but needless to say they do not agree with me even though I have supplied photos with the disc the right way round and edged in red with the blue pass in the middle. Also I have enclosed a short script from the owner detailing my stay at the property to prove I was there legally. I have appealed further to the IAS as per ARMTRAC's instructions and am awaiting further action but having read various forums I don't hold much hope of being successful. You may have come across similar situation to this and wondered if you could give any advice/guidance please. You are up against the Supreme Court ruling in Beavis v Parking Eye which is the law and is interpreted by parking enforcers to issue any reasonable penalty for breach of their rules. Until Sir Greg Wise private members bill to control parking enforcement is enacted, that is the law. However, you could let it run to Small Claims where the basis of your appeal would be that the PCN was ridiculous because it was evident from the warden’s photo that the parking pass had fallen off in the hot sun. A good judge would find for you in that circumstance, accepting the old 'Act of God' defence that the ticket coming unstuck was not something you could 'reasonably' have predicted. I bought a year old Skoda Octavia 1.4TSI from a dealer and have had it serviced by them as recommended. After a year, with 20,000 miles on the clock, the turbo stopped working. This was fixed under warranty. Two years and 20,000 miles later the same fault has arisen. The warranty on the first repair was only until the end of the 3 year initial warranty. I am now quoted about £1,100 for a new turbo, a "generous" 35% discount because it has been regularly serviced. The Skoda Customer Relations think that this is a good deal: £600 discount with no explanation of the fault or guarantee of it not re-occurring. Is this a common fault on Skodas? Should I accept the offer of repair and what guarantee can I expect? On returning to my car in a car park recently, I was disappointed to observe that someone had slammed their door so hard into mine that it had left a significant dent (and paint from their car) on the passenger door of my shiny new VW Golf. I assumed that a fill and respray would be required at considerable cost and inconvenience. However, a friend suggested that I try a dent removal firm (Excel Dents, Aylesbury). I took my car in and one hour later the dent was virtually gone and it was much cheaper (and obviously quicker) than the respray route. I didn't even know these dent removal places existed, so if your readers are annoyed at a dent in their door left by some kind soul, I highly recommend they explore "paintless dent removal" in the first instance. I own a 2014 Skoda Yeti 1.2TSI. It is the second Yeti I have had, and we have other Skodas in the family. I purchased the car from a franchised Skoda dealer on the 15-05-2017, and actually took physical delivery on 01-06-2017, mileage 40,720. At the time of purchase PCP, I took a warranty for 12 months. The car had previously been on the Motability scheme. The car ran fine like my previous Yeti until May/June this year when I started to notice an odd sound from the front. I first thought it might be tyre noise or a wheel bearing. The noise slowly became more noticeable, so I booked the car in to the supplying dealer for test drive and diagnosis on 30-07-2018. The senior technician suggested the noise/rumble was coming from the gearbox and it would need to be stripped, investigated and repaired. The cost of this work would be in the region of £1,200 - £1,400. Naturally, with the mileage at 56,200, which is nothing on a modern car, I feel this problem should not have arisen. I asked the dealer how we should proceed and left to contact Skoda direct, which I did. The Skoda original warranty on a new car is 3 years or 60,000 miles. Skoda turned down my request for assistance towards the cost. Is there anything I can do? I recently purchased a second-hand Ford B-Max, first registered January 2018, with 1,800 miles from my local Ford dealer. After a week I noticed damage on the o/s rear wing that had been repaired very badly (a botched job). I took the car back and pointed it out and it was then taken to their body shop for an estimate which was £600. The dealer is now saying that I have to pay £200 towards the cost. I say that the so-called repair should either have been pointed out to me or the car should have been repaired properly before being put on the forecourt and that I should not have to pay anything. Could I have your opinion and advice please? I was driving along the A12 at 70mph when my MINI Roadster started running a bit lumpy. The display read “drive moderately if problem persists contact MINI service “. I slowed down to 40mph, but it was getting worse, so stopped and called the breakdown service. They thought it might be a blown head gasket as the expansion tank was empty and the oil filler cap was contaminated. Barons MINI Stansted told me that the cylinder head core plug was gone and a new engine was fitted at a cost of £6,762.70 with a MINI goodwill contribution of £2,765.67 making it £3,997.03. My car is a 2012 MINI Roadster Cooper 1.6, purchased new and maintained meticulously by Barons MINI Stansted. It’s done 21,991 miles with 5 stamps in the service book. I have been advised that this could be considered a manufacturing defect and as such MINI should have replaced my engine free of charge. I would welcome your honest opinion as my husband reads your column and believes your advice is always fair. We own a 2014 FIAT 500L Trekking and have enjoyed over 3 years of owning and driving it. 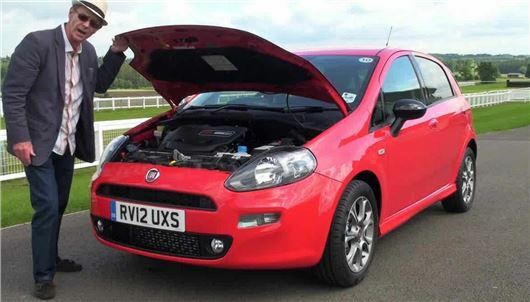 It has been serviced regularly by our local FIAT dealer from whom we bought it and it has been trouble-free until 2 weeks ago when the engine warning light came on and the “start stop unavailable” message appeared. We took it to our FIAT dealer who put it on the computer which read “low voltage”. FIAT said it needed a new battery, which we agreed to have replaced. The next day, the same warning lights came on, so we returned the car to the garage who phoned later in the day to say the computer told them there was a blockage in the oil pump, which would need replaced. They also told us that the timing belt was worn and that they could replace that at the same time to save us money on labour. With 82,000 miles on the clock we were aware that timing belts often need replacing at this stage, so we agreed. Having parted with £900 for all of these repairs and no warning lights showing, we trusted that this would be the end of any problems for a while. However, less than 20 miles later, the same warning lights appeared again and the warning message again said, “Check engine.” The garage had closed for the weekend, but we will be taking the car down first thing on Monday morning. Do you have any advice? Do you know, is this a common occurrence with the FIAT 500L? Have we had unnecessary replacements fitted? Could it just be a warning light / computer fault? Would we get anywhere by taking our grievance higher up and if so, to whom? This is quite a high mileage car for 4 years old. Presumably it's a diesel? How often have you been getting it serviced? Could be that if the oil has not been changed every 10,000 miles and especially if the old oil has been siphoned out rather than drained from the sump plug, the sump oil strainer is blocked. I have had an Audi Q5 for 7 years, with 88,000 miles, and has been utterly reliable except for AdBlue sensor problems and emission problems. I have had the Audi correction of emissions done just over a year ago. Part of the very complicated AdBlue system has a small leak, which is being replaced by my dealer. I know that you say that a car is only built to last 8 years, but I thought that a premium car like an Audi would last longer. My wife and I are nearly 80 and we love driving and going on caravan holidays. We are not wealthy, and bought the Audi as our last car. We maintain it to the highest standard, changing the engine oil at 8,500 miles, the auto gearbox oil at 38,00 miles, and all of the fluids have been changed. It is run on Shell or BP diesel. The car is very comfortable, easy to get in and out, and a pleasure to drive. I cannot afford to buy a new Q5, and will not buy a used one. I can afford to buy a new City Type car, such as a Hyundai, KIA or Nissan, automatic-petrol. We would use this on a daily basis, for shopping and short runs up to 50 miles round trip. Then use the Q5 for towing our caravan/light trailer, and visiting our family in Hampshire, a round trip of 400+ miles, as we need the Q5’s comfort, My theory is that the mileage on the Q5 would be halved, and that the particulate filter would run clean and less liable to emissions problems on longer runs and pulling the caravan, and less liable to cause problems. Please could you advise if this a sensible theory or not, and which make of city car I should buy? A premium car is not built any better or built to last any longer or is of any better fundamental quality than a regular car. The price premium is for the status it affords the owner. But your plan makes good sense to me. The enemy of a diesel's complex emissions system is running it for short distances. If you restrict your Q5 to runs of 50 miles or more it will be more reliable than if you use it for short runs. A KIA Picanto comes with a 7 year warranty. 4 years long than an Audi warranty. My daughter recently bought a second-hand car from a national dealer chain. First registered 21-8-2012. Odometer reading, 7,453 miles, six months MoT left. She drove it 200 miles home. Not happy with the car, she took it to her garage who provided a written report. "All 4 brake discs found to be heavily corroded and seriously pitted and not suitable for use." Could the MoT have been a fake? I was behind a van on the A18 earlier today which was travelling at under 40mph (the A18 is a 50mph road). I indicated and began my move to pass (the road was clear for half a mile) when the van driver accelerated in an attempt to stop me passing. I had already committed and the car that was behind me also began to follow me so I could not go back. Fortunately, I could out accelerate this old van and managed to pull in. The car behind had to brake hard and drop back. The van driver then flashed and hooted at me as it was clear he did not like being overtaken. This is not new. I encounter this sort of behaviour more and more. Could someone please tell me what it is about being overtaken that turns these people into dangerous drivers? The van driver was having a bad day or was upset about something else and simply took exception to you or your car. Actually "dangerous driving". He had no right to do this. If he'd done it to an unmarked police car with a camera system he would have been charged with the offence. No one has the right to lose their temper on the road. Happily your IAM training has taught you not to react in kind. I am confused by the way Audi Chingford is dealing with what I thought would be a simple (if expensive) warranty repair. When pointing down a slope and trying to reverse up a hill, after taking my foot off the accelerator, my Audi A5 s-tronic, instead of holding and then heading up the hill, rolls forward between 15cm and perhaps 45cm. If on a steep hill this does not occur as there is some sort of braking system that holds the car for a couple of seconds once you've put your foot on the brake but on shallower slopes this doesn't appear to kick in. This also occurs, although to a much lesser degree, when pointing uphill and trying to drive off. Again the 'hold' doesn't engage on shallower slopes. Audi Chingford and Audi's Master Technician claim that this is within tolerances and is a characteristic but this all sounds nonsense. Surely a car should go in the direction you intend it to? The answer is normally to left foot brake. But I agree, even wet clutch DSGs and s-tronics can be awful to reverse uphill and there seems to be something wrong with yours. I had the same horrible experience in a T6 Caravelle on Tuesday, and that was after left foot braking. I have a problem with my ABS, Traction Control and Hill Start lights being illuminated yellow on my 2014/64 Vauxhall Combo Van. It has been in the garage and they have changed the rear driver side wheel sensor and the brake light sensor switch, but the problem persists. I am advised that it will not pass it upcoming MoT if the root of this is not rectified. Any advice or direction would be most welcome. I am a company car driver and my car renewal is due. I currently drive a BMW 528i SE Touring (petrol/auto), which suits my needs well. For renewal I’d like to go greener (in part to reduce the BIK charge), but choice seems limited if I also want to keep to an estate with decent range, performance and a quality marque. What would you recommend? I have a budget of £50k. If I delayed a year would a better choice be likely to emerge? You can get a VW Passat GTE plug-in hybrid estate. Very impressive. New BMW 330e plug-in Touring by this time next year. Also a Mercedes C350e plug-in and a new C200EQ Boost 48v mild hybrid. May be they did and HJ is just presuming they did not replace them. To have two turbos fail each at 20,000 mile intervals suggests to me the driver is regularly switching off the engine after hard driving causing the bearings to cook and not be mechanical issues. That was quite mild; I had a Cargo Daily driver swerve at me, forcing me across TWO lanes; then RAM me. Despite Police attendance he was never charged with anything (nor beathalized), even after being recorded threatening to kill me. I have a Golf mk7 Gti. 33000 miles just short of three years old and turbo failed . The Vw garage admitted they were replacing a lot of turbos and they believed there is a manufacturing fault for so may to go. Impassible situation: this happens to me a lot! I am a young man who drives an Iris Red (read: metallic pastel pink) Honda Jazz, and people, especially middle aged men in German saloons and white vans) HATE being overtaken by me. I have experienced a very similar episode overtaking a slow travelling vehicle on a 1x1 a-road where the vehicle I was passing accelerated holding me in the opposing lane despite oncoming traffic. Only hard braking and pulling back in kept me from a head on collision. Regularly on the motorway cars to my left will accelerate to keep up and hold me in the fast lane. Sadly my little Jazz is not powerful enough to out-accelerate these fragile beings and so usually I resign myself to pulling back in until my next chance to try and pass (usually when a slower van or lorry in their lane impedes their progress). Impassable Situation : suggest you get a dash-cam fitted, and if you have the situation re-occur, you can upload your footage for the police to review and charge as required.